Though unofficial news leaked this morning, this afternoon, independent sources are acknowledging a new fact: A computer made with IBM Cell and AMD Opteron processors can process a thousand trillion operations per second. This afternoon, the itinerary of the International Supercomputing Conference in Dresden was officially altered to make way for a special panel, acknowledging what the US Department of Energy had announced a few hours earlier: Its Roadrunner supercomputer, built by IBM as a unique hybrid of Cell BE and AMD Opteron processors, has recorded an official throughput speed above one quadrillion floating point operations per second -- one petaflop. At the DOE's Los Alamos National Laboratories in New Mexico, there's a supercomputer called Roadrunner built using 12,960 of IBM's specially modified Cell eDP processors -- using the same basic architecture as the chip at the heart of Sony's PlayStation 3 -- coupled with 6,912 AMD Opteron processors. The International Supercomputing Conference reported this afternoon that Roadrunner posted a peak performance score, using the Linpack benchmark, of 1.026 petaflops per second, in a test conducted last month. In a rare preview of the University of Mannheim's twice-annual TOP500 list, the ISC's Prof. Hans Meuer announced Roadrunner would indeed surpass the long-standing IBM BlueGene/L supercomputer, hosted at Lawrence Livermore National Labs, when it publishes its June list next week. "Twenty-two years ago, in 1986, the legendary Cray 2 passed the 1 gigaflop/s level, and in June of that year we held the first ISC," Prof. Meuer wrote. "Eleven years later, when the Intel ASCI Red system landed atop the ninth TOP500 list presented at the conference, this was the first time a system reached the teraflop/s level. And now RoadRunner has cracked the next magical barrier and will be number one on the 31st edition of the TOP500 list." How much of a trouncing will this represent? In last November's list, using the U. of Mannheim's preferred Linpack benchmark, posted an Rmax score of 478,200 -- or just under 0.48 petaflops per second. Granted, BlueGene/L may have accelerated since then, but it had a long way to go. 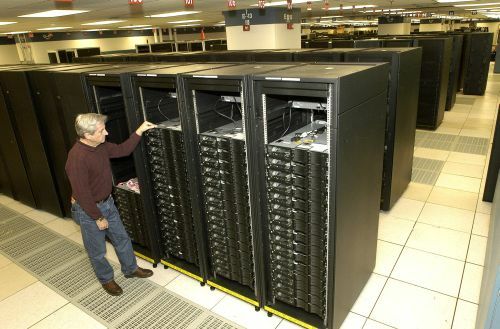 If there is another supercomputer in the petaflop race that broke the petaflop barrier, its hosts apparently lost out to the DOE in the race to register that fact. So as it stands now, one of the big losers in the petaflop race could be Sun Microsystems. In June 2007, Sun set a goal for itself for a 1.7 petaflop computer, perhaps by next week's conference. Sun still has about a week to surge in front of IBM and LANL and seize that #1 slot on the TOP500 list. But the proverbial tape at the finish line is streaming today from Roadrunner; and at this point, its competition is starting to look like 499 coyotes left in the dust.